I spend at least eight hours a day in front a computer. We’ve all heard the adage that sitting is the new smoking. The company I work for (my day job) has started to invest in standing desks, and I'm lucky enough to have one that I use on a daily basis. Over the last month I’ve been testing out a compliment to the standing craze, and it’s called a Wurf Board. It’s an inflatable surfboard-styled mat that you stand on when using a standing desk. 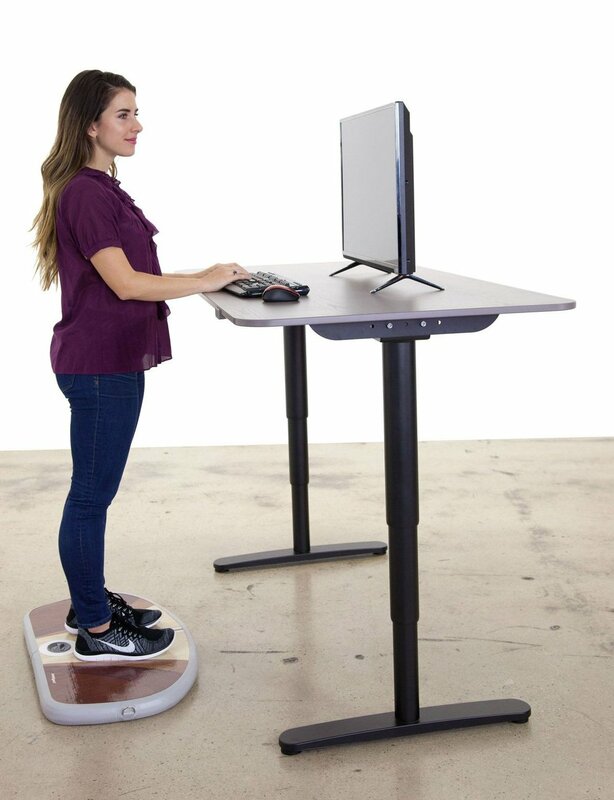 Its goal is to make the time you're standing more comfortable and better on your posture. How well does the Wurf Board work? Well, let’s find out. The Wurf Board is the healthiest way to stand with revolutionary air-spring technology. Impressively durable, it’s high-tech, aerospace-grade materials are engineered to outlast any foam or gel-based mat. Highly supportive, fully adjustable air-spring mat lets you tune it for your weight and performance needs. The Wurf Board comes in several sizes: Small is 28.3 × 14.2 × 2 inches, max user 200 lb; Medium is 30.9 × 16.7 × 2 inches, max user 250 lb; Large is 32.9 × 17.7 × 2 inches, max user 300 lb. As the name implies, the Wurf Board is a play on a surfboard and as such it's styled with a surfboard in mind. The Wurf Board comes in a pretty small box (getting it back in the box is not easy, though) and uninflated with a small device that helps you inflate it. The packaging and directions are incredibly concise and easy to follow. Within five minutes, I had the Wurf Board out, inflated and ready to use. Over the first couple of days of use, I found myself inflating and deflating the board to find the right balance for me. From a pure design aesthetic, you're either going to love or hate the design. As someone born and raised in Southern California, I can appreciate the kitschy surfboard design. Not only are the decals on the board made to represent a surfboard, but even the curvature of the board itself has a nice surfboard look to it. There’s nothing cheap about the design either. The material used to construct the Wurf Board feels incredibly durable. I have no doubts that it will last you a long time without issue. I stand for at least three to four hours a day. Before the Wurf Board, I used a very thin mat to stand on, or more often than not just stood on the industrial carpet in the office I work in. Once I found the right level of support in the Wurf Board, I was ready for its daily use. For me, I was probably hitting about 80% inflation. If you go fully inflated, as I tried a couple of times, I found it’s only slightly better than just standing straight on the ground. It took me about a week to get used to using the Wurf Board. There’s just enough give in the board that it allows you move your weight around. For me, that was a little jarring at first and actually made me pretty fidgety. Like with any new gadget, I found myself spending a lot of time messing around on the board than actually getting down to work. Also, per the design, the Wurf board is an instant conversation starter. Whether in a beautiful modern office or an old drab run down cubicle farm, there’s no doubt anyone coming into your space will notice the Wurf Board and want to try it out. I can’t even count how many people tried my Wurf Board over the month or so of testing. Once I got past the newness of the Wurf Board, I started to really enjoy using it. I never felt the “extra energy” the Wurf Board website claims you will get from it, but I did find it to be a lot more forgiving on my body than a basic mat. Not overly surprising, but about three weeks after I found the right inflation point, I did find that it lost some of its air and I needed to inflate it quickly. Luckily that process is super quick and easy. The other nice thing about the Wurf Board is that although it’s got a very nice feel to it, its super light and makes storing it out of sight at the end of the day or when you sit down a breeze. Whether for work or long video game runs, I personally love the ability to stand and work. The Wurf Board, although not perfect, is a huge improvement over a simple mat. It’s also a heck of a lot more fun. It does retail for around $200, which is my only hesitation in recommending this product fully. It’s well-designed, feels incredibly durable, and makes standing a lot more fun. But it’s pretty pricey in comparison to a lot of their competitors. Both in form and function, the Wurf Board is a well-designed product. If you can afford it and want a discussion piece at your workplace, then it’s a great option. If you’re looking for straight utility, there are probably more affordable options out there. The battle for your living room is one of the most competitive landscapes in tech. Whether you're going with a $30 Chromecast or $500 Xbox One X, there's a huge battle for what will become your primary consumption device in the living room. Today though we’re going to be looking at another entry into that market that’s got a unique take. It’s the NVIDIA Shield TV Pro and its a hybrid of a traditional TV streaming device as well as a gaming platform. Last year I made the upgrade from a six-year-old HD LCD to a 4K LED TV. I went with a 65” Samsung KS8000 that I’ve loved quite a bit. I, of course, wish there was more 4K content out there but when I have it, the set looks great. In the last couple of weeks, I was asked if I wanted to review the Luminoodle Bias Lighting, backlighting that you put on your TV to help with eye strain. I’ve been using it for a couple of weeks and am here to tell you what I think. Over the last couple of weeks, I’ve been testing out the Shuttle X1 Gaming PC, an ultra compact gaming PC that packs a lot of power in a small footprint. The big question in my mind was, what am I giving up with this smaller form factor? And the good news is not much. ver the last month, I’ve been testing a new messenger bag from Peak Designs called the Everyday Messenger Bag. If you missed it, the Everyday Messenger Bag was Kickstarted a couple of years ago with over $4 million pledged making it the “most funded bag ever” according to Kickstarter. Is the bag worth the hype? The Logitech G413 is an easy recommend for anyone looking for a slick mechanical keyboard. From a design standpoint it's stunning, and it actually looks a lot more expensive than it is. From a use case standpoint with the gaming keycaps, versatile Logitech software and a robust design, it’s an investment that should pay dividends for years to come.